Researchers from Tel Aviv University recently published a study in the journal Fertility and Sterility comparing fertilization and pregnancy rates between extracted and ejaculated sperm in patients undergoing ICSI (intracytoplasmic sperm injection). Patients in the study suffered from cryptozoospermia or hidden sperm. In all, 116 ICSI cycles were completed with 17 patients. All patients underwent ICSI with ejaculated sperm prior to ICSI with extracted sperm. Fertilization rates were similar between the two groups, but implantation and live birth rates differed. ICSI with extracted sperm resulted in higher implantation and live birth rate among the 17 patients with cryptozoospermia. 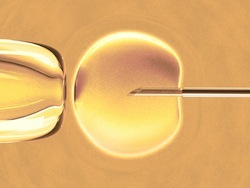 Researchers suggest extracted sperm is a viable option for patients who do not respond to ICSI using ejaculated sperm. Results of the study took into account maternal factors that could have altered fertilization, implantation and birth rate. Source: Ben-Ami I, Raziel A, Strassburger D, Komarovsky D, Ron-El R, Friedler S. Intracytoplasmic sperm injection outcome of ejaculated versus extracted testicular spermatozoa in cryptozoospermic men. Fertil Steril. 2013 Mar 8. pii: S0015-0282(13)00297-5. doi: 10.1016/j.fertnstert.2013.02.025.